This super resin replica Horse Head is realistic but will not offend! 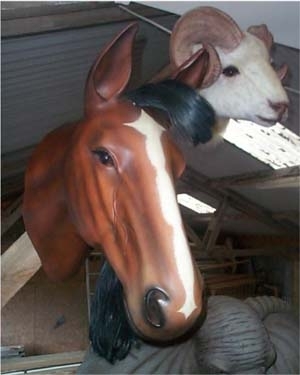 The Jolly Roger Life-size Models range of Animal Heads are a fantastic way of adding to a Country or Farm scene. 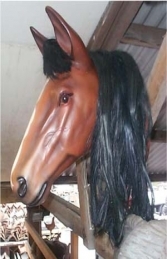 This wonderful resin model Horse Head mounts on the wall or can be placed peering over a stable door an any Farm or Country themed areas in adventure golf courses, zoos, theme-parks or to promote shops, businesses, pubs, restaurants, coffee shops. It would even look fabulous in your own home or garden. 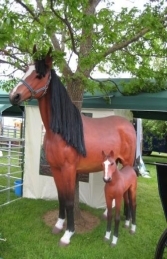 PLEASE CONTACT US ON 01626 833646 or 07860 680181 TO DISCUSS THIS MODEL & THE OTHER FIGURES IN OUR COW & FARMYARD ANIMAL SERIES. PLEASE PHONE US TO PLACE AN ORDER & FOR A QUOTE FOR DELIVERY COST TO YOUR POSTCODE.